We were so blown away by this sauce! If you read “Texas Pete” and you think – hot sauce – cayenne – pedestrian… well think again! No… there is some serious flavor here. A BBQ flavor with a sticky sweet heat. Marilyn: There’s a lot of vinegar coming out – sweet, tangy, definitely has some heat! We soaked these wings in the sauce to let them set up and get less vinegary… it did get better. We thought this would just be another buffalo wing sauce but it turns out it’s a BBQ style sauce with that classic Texas Pete heat. It’s hard to compare it to anything but a BBQ sauce. But I think it compares to a restaurant quality bbq wing sauce. There’s liquid smoke flavor and it’s hotter than any other hot bbq style wing sauce. It tastes so much better than just out of the bottle. If you like a Teryaki sauce, and there’s a lot of sugar/sweet in this, you would like this sauce. It’s so good I’m suckin’ the bone. Brian: Yes, Texas Pete Fiery Sweet Wing Sauce is a BBQ sauce… with heat. On the bottle, out of 4 peppers, they give it 2. Laff! It’s hotter than that. It’s a cross between a thin Sweet Baby Ray’s BBQ sauce and a hot sauce. We were surprised that from Texas Pete it would have such a BBQ slant. I’m scooping up the blue cheese to cool me off. The sauce is sitting on top… there’s not a lot of soaking in with it. Also I taste a lot of sugar too, and sweetness. But it’s hot and tangy. If you got these wings at a restaurant, you’d be happy. You’d think they were the joint’s home recipe. It is on the thin side, a bit more than a glaze, but it’s complex. As a rule I don’t care for a “hot” BBQ sauce in general… but these wings are more of a BBQ sauce on a hot wing. I’d love to throw a ton of minced garlic into this. It’s a huge 18 OZ bottle of BBQ Sauce with heat. Final Thoughts: Throw some minced garlic at this and maybe some whiskey and you could doctor this up to be a great wing sauce! We thought these 2 would make a great Head to head Smackdown kind of review, but sadly, the Frank’s paled in comparison. 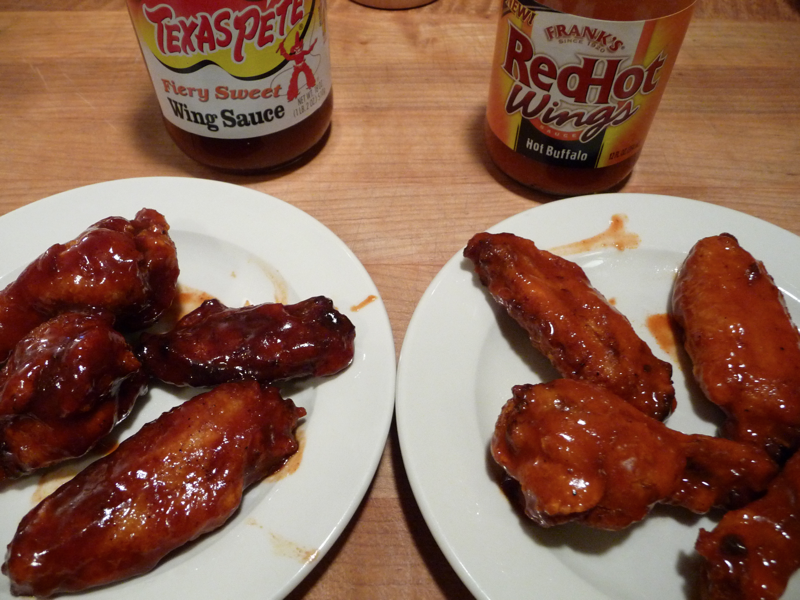 We include our few comments here only to round out this wing sauce comparison. Marilyn: This is even more vinegary than the Texas Pete. I don’t even want to eat these. After trying one, I’ve decided it is inferior to the Texas Pete wing. It’s all hot and not good. Brian: It’s very pedestrian, just hot and not at all impressive. I would stay away from this. Now we love the classic Buffalo Wing Recipe made with Frank’s RedHot and butter, but the Frank’s Buffalo “Hot Buffalo” just ain’t it. We ended up throwing the Frank’s RedHot Hot Buffalo Wings into the Texas Pete Fiery Sweet Wing Sauce just to try to make them better. Thanks for the info! Even though we love it NAKED…its good to learn more about sauces! If you like hot bbq sauces on your wings, try DL Jardine’s Louisiana Cajun Cayenne BBQ Sauce. It’s amazing, spicy, and it isn’t too sickly sweet like some bbq sauces. I got it at Hannaford, not sure if you have one of those in your area. Is the Texas Pete wing sauce actually hot? Texas Pete itself is one of the mildest “hot” sauces you can buy. Yup! 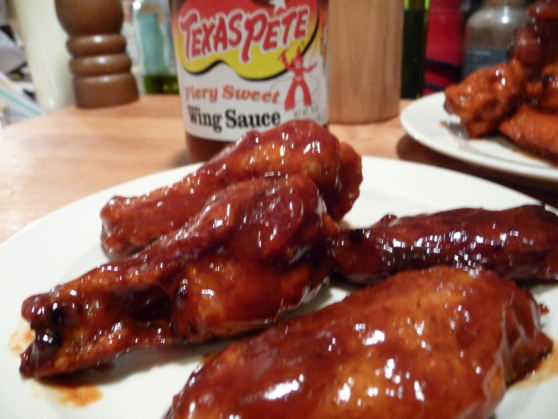 There’s a considerable amount of heat in the Texas Pete Wing Sauce. I’d rate it 2.5 out of 5. Thanks for your comment, it reminded me to include the rating of the sauce in the post. Brian & Marilyn, I was looking up Texas Pete wing sauce after this review and they have a regular buffalo wing sauce. I’m gonna get it this week or next and try it out. Thanks for the great reviews, I’m finding lots of new wing sauces. I really appreciate the week of wings idea, you should do it every week forever, or at least once a month. Living in the UK it is hard to comment on these sauces as I have never tried the brands you are reviewing. However, I tend to find that nearly all shop bought sauces tend to fall down in two areas, they are either too tart or too sweet, and given what you have said American bottled sauces have the same flaws. Thanks for chiming in and bringing us a view from across the pond! I agree that commercial sauces usually need a little something extra added. Mass produced products like Texas Pete are the biggest culprits, but I stand behind the “small batch” or “hand made” wing sauces that we’ve reviewed here at Hot Sauce Daily. I’m sorry, but I love the “sweet” and we both love Sweet Baby Ray’s BBQ sauce. Original tho. It’s yet another sauce that needs to be doctored up. We’d tried the Sweet ‘N Spicy on pulled pork and ribs and yes, it is *very* sweet! Good call Jen. Maybe I’ll try the Original Sweet Bay Ray’s then. I only got the Sweet ‘N Spicy because I love jalapenos, and that part was delicious. But maybe this version was meant to be a lot sweeter than the original, I think the high fructose corn syrup was listed higher on the ingrdients list. I’ll give the Texas Pete a try then, your reviews have always steered me clear! Hey James. We love Bone Suckin’ sauces here. But are you talking about the BBQ sauce or the Hot Sauce? I checked their website out and it looks like I’ve been using the original blend bbq sauce. It has a hint of bbq but is nice and bitey in the after taste. Have you tryed their mustard yet? I’ve been chomping at the bit for some of that. But im staying in a hotel, I’m outpatient for AML. Correction I’ve been using the 5oz bottle that has hiccuping sauce at the bottom. So I guess the hot sauce, regardless its delicious. I love watching my friends sweat when they try a pin prick worth of it and then I take half a tablespoon and put on a brawt and lick my fingers clean of it. Texas Pete will be at the NYC Hot Sauce Expo this weekend. I’ll see if I can score a couple of bottles of the mustard sauce.